TEM Controllers – PL Engineering Ltd.
Thermoelectric Controllers of DX5100 family represents a range of precision-programmed devices (standard and OEM versions) for management of thermoelectric coolers (TECs, Peltier modules). DX5100 Controllers have a bi-directional (heating and cooling) PID regulation with PID Auto-Tune function. Besides the PID regulation additional modes of operation are realized in the Controller: DC voltage mode, T-regulation and programming of an object temperature behaviour with time. Digital input-output interface allows to synchronize DX5100 with another devices and external impacts. DX5100 allows maintaining a given temperature of a thermoelectric (TE) cooler with high accuracy or programming heating and cooling in time. The unique diagnostics function for thermoelectric cooler is realized in the device. The diagnostics includes the measurement of the TEC AC resistance, TEC figure-of-merit and Time Constant. 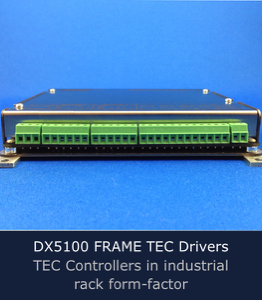 DX5100 TEC Controllers are available in three groups: TableTop, Frame and OEM. The key difference is form-factor and in application focus. DX5100 TableTop is the ready-to-use tabletop solution with all the features included. It’s a perfect solution for laboratory setup and experiments, optimal for QC and R&D work. DX5100 Frame devices have several versions and industrial form-factor for integrating in industry standard racks. Frame versions are optimal for quick assembly and setup of multi-channel TEC control systems in industry standard format. DX5100 OEM controllers are pure OEM devices for deep integrating in customer devices and systems. DX5100 OEM controllers have several versions with modular concept, where device functionality can be modified/extended by additional extension boards. 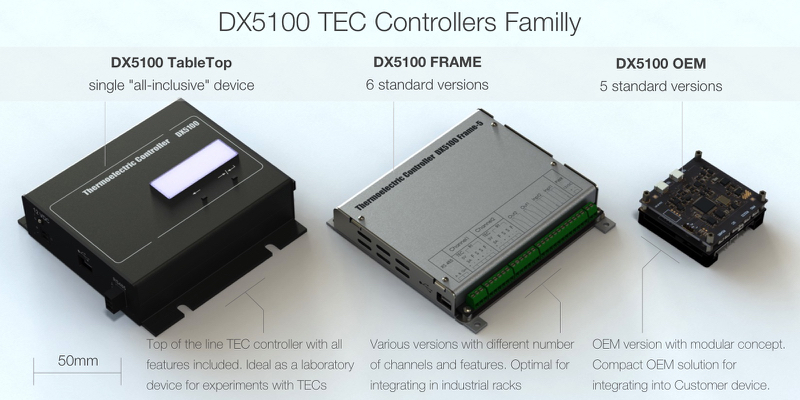 DX5100 TableTop is the top device in DX5100 controllers family. This is the ultimate solution with all required features and regulating modes for the best control of thermoelectric coolers operating. 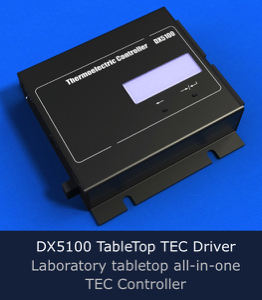 DX5100 TableTop is the essence of tabletop thermoelectric cooler drivers. DX5100 Frame controllers in industrial housing for integration. The complete plug-n-run sets for thermoelectric coolers regulation. TableTop version functionality in industrial rack form-factor. Six versions are available, depending from number of channels, max power output and few other features. 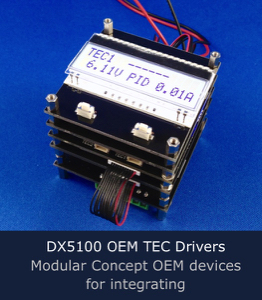 Cost-effective DX5100 OEM solutions with modular concept. Have the same functionality as standard DX5100 Frame controllers, but provided in OEM sets for deep integrating into Customer applications. Modular concept allows to modify and extend controller functionality using expansion boards.